Those who struggle with obesity, take heart. Losing as little as 5 percent of your body weight is enough to reap significant health benefits, according to a study. The randomized controlled trial of 40 obese men and women compared, for the first time, the health outcomes of 5 percent, 10 percent, and 15 percent weight loss. While additional weight loss further improved metabolic health, 5 percent weight loss was sufficient to reduce multiple risk factors for type 2 diabetes and coronary heart disease. Magkos et al. demonstrate the profound therapeutic effects of weight loss on metabolic function in subjects with obesity. This visual abstract shows how even a moderate 5% weight loss has considerable health benefits, including decreased intra-abdominal and intra-hepatic fat and increased multiorgan insulin sensitivity and b cell function. Additional weight loss further improves many cardiometabolic outcomes. Those who struggle with obesity, take heart. Losing as little as 5% of your body weight is enough to reap significant health benefits, according to a study published February 22 in Cell Metabolism. The randomized controlled trial of 40 obese men and women compared, for the first time, the health outcomes of 5%, 10%, and 15% weight loss. While additional weight loss further improved metabolic health, 5% weight loss was sufficient to reduce multiple risk factors for type 2 diabetes and coronary heart disease. Obesity is a major risk factor for a number of chronic diseases, including diabetes, cardiovascular disease, and cancer. Most treatment guidelines, including those recently proposed by several major medical and scientific societies, recommend moderate weight loss of 5% to 10% to achieve improvements in metabolic function and health. “However, it is much easier to achieve a 5% weight loss than it is to achieve a 10% weight loss, so it is important to understand the health benefits that occur with a 5% weight loss and what additional benefits can be expected with more weight loss in people with obesity,” Klein says. To date, several large randomized controlled weight loss trials have evaluated the effects of different amounts of weight loss on clinical outcomes. But until now, none have separated the weight loss outcomes in those who achieved 5% weight loss from those who achieved 10% weight loss. Klein and his team set out to address this question by randomly assigning 40 obese individuals to either maintain their body weight or go on a low-calorie diet to lose 5%, 10%, or 15% of their body weight. Importantly, all of the study participants showed signs of insulin-resistant glucose metabolism–a major risk factor for type 2 diabetes. When blood glucose levels rise after a meal, beta cells in the pancreas release a hormone called insulin into the blood, stimulating muscle, fat, and liver cells to take up the excess glucose. But in individuals with insulin resistance, glucose builds up in the blood instead of being absorbed by the cells, increasing the risk of type 2 diabetes. 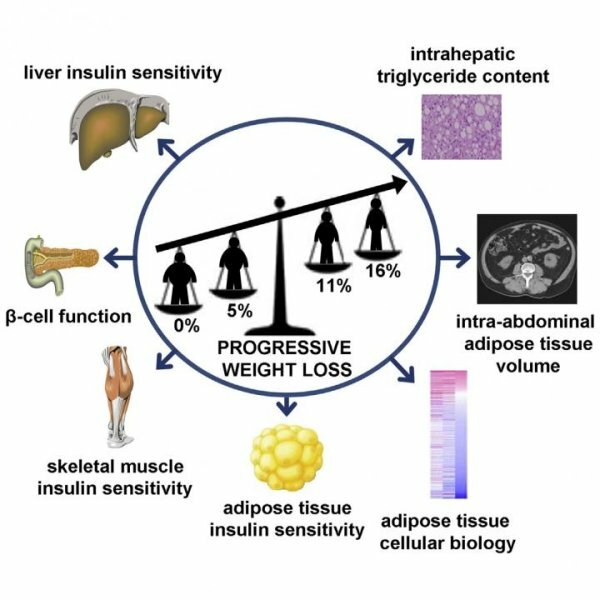 Among the 19 individuals who lost 5% of their body weight, beta cell function improved significantly, as did insulin sensitivity in fat tissue, liver, and skeletal muscle. Meanwhile, the nine participants who achieved additional weight loss showed further improvements in beta cell function and insulin sensitivity in muscle tissue. “Taken together, the findings show that 5% weight loss is sufficient to improve health outcomes, with additional weight loss further decreasing risk factors for metabolic and cardiovascular diseases,” Klein says. According to the authors, future studies should evaluate the effect of progressive weight loss on other obesity-related complications, such as arthritis and lung disease. It will also be important to test whether the findings apply to people with diabetes and to examine the cellular basis for the observed therapeutic effects.